The United Architects of the Philippines (UAP), an integrated and accredited professional organization of architects, made innovation and sustainability this year’s agenda for its Convention Exhibit with its adopted theme “Innovative Architecture, Sustainable Future.” UAP on its 40th (Ruby) Foundation anniversary highlights green architecture and ground-breaking design in its lively showcase of products, materials, technologies, and services for building and construction. 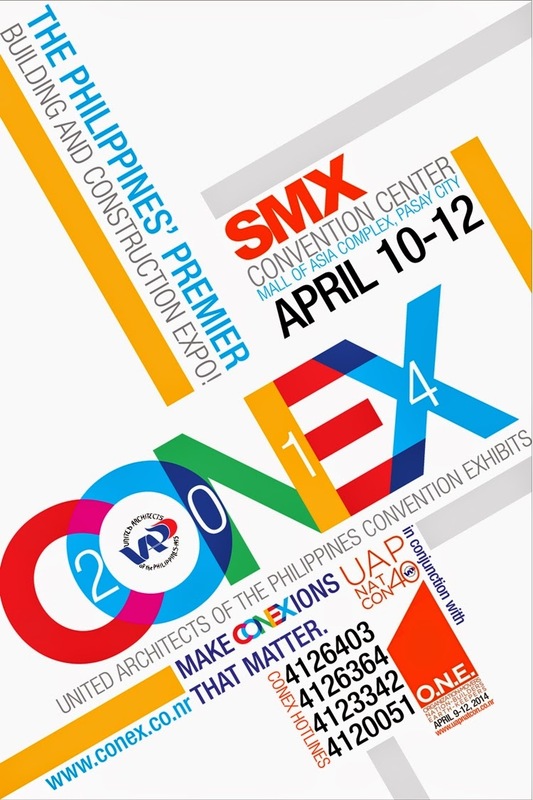 UAP held the country’s premier building and construction expo “UAP ConEx 2014: Innovative Architecture, Sustainable Future, on April 10-12, 2014 at the SMX Convention Center. The three-day event showcased exhibitors from construction supplies, product technology, design management, electrical equipment, government documents assistance, and a lot more. The opening ceremony was graced by Architect Shamcey Supsup-Lee, UAP member, along with the UAP ConEx Chairman Tony Vasquez (FUAP, APEC architect), and UAP National President Sonny Rosal (FUAP, APEC architect) at the SMX Convention Center, Mall of Asia (MOA) Complex, Pasay City. UAP continues to fulfill its relevance in society and be of aid to the Filipino people through over 500 exhibitors with product technologies and partnership with government agencies for exclusive services the convention offers to the public. The latest technology in architectural firms abroad is now brought to the Philippines with the 3D printer installation that ConEx visitors can try-out at the expo. Although some local firms already carry the technology for its premier designs, this is the first time that UAP made 3D printer more accessible to the public. Visitors can actually witness and experience how the technology works. From design technology to disaster preparedness, key exhibitors also offered flood control and efficiency in power use after recent super typhoon Yolanda hit the country. Unlike other construction expos in the country, the UAP ConEx is the only exhibition that is organized by the group of accredited architects showcasing the best from the country’s well-esteemed architects such as Raul Locsin, Meloy Casas, William Coscolluela, Ed Calma and Budji Layug. Over 500 architects were expected to participate in the three-day expo. Another unique offering of this expo was the face-to-face interaction with professional architects about development and/or renovation of either a residence or office building. Visitors had an access to free consultation with professional architects. UAP also hosted a series of seminars on ‘Business of Architecture’ and ‘Architecture for Nation-Building’ modules in which the public can get insightful tips and information from architects themselves. Not only do the seminars discuss technological design, UAP also offers architectural tours and talks on climate change and survival of architecture. Aside from its core expo offerings, UAP partnered with key government agencies to provide public services to visitors. At the expo, guests also had the chance to process their NBI clearance, PAG-IBIG. They had their government, professional IDs renewed. ConEx visitors did their transactions with ease as state-of-the-art facility and entertainment are provided at the exhibit area. Vasquez shared that architecture echoes a country’s history and the rich heritage of the Philippines. At the expo, you will see that architecture evolves and it is relevant to our present as well as our future lives, he added.